Short Info:- The department, Cochin Shipyard Limited has released the official notification regarding the Cochin Shipyard Limited Recruitment 2019 for 50 vacancies for Technician Apprentice, Trade Apprentice positions. The registration process will start from 17 April 2019 and will be going till the 2 May 2019. Cochin Shipyard Limited has been released the recruitment notification. This notification is for the Technician Apprentice, Trade Apprentice profiles. In this article, you will find complete information regarding the Cochin Shipyard Limited Recruitment 2019. We have gathered all the information essential to apply for the same such as Online application fee, age limit required, eligibility, number of vacancies, the application process, important dates and pay scale, etc. In case of any doubts or queries, you can ask us just by putting your queries in the comment section. The department, Cochin Shipyard Limited is going to appoint eligible candidates for the Technician Apprentice, Trade Apprentice positions. Aspirants who seek the job for the department can encash this opportunity. We have reported that there is a total of 50 posts are allocated for the declared post. Eligible candidates can apply for Cochin Shipyard Apprentice Recruitment from 17 April 2019. The online application portal will be closed on 2 May 2019 i.e. the last date to submit the online application. The links to apply for the declared recruitment is on the official website www.cochinshipyard.com. 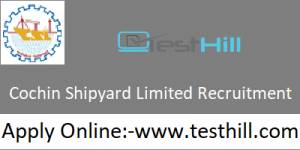 The Cochin Shipyard Limited conducting the online examination for the declared vacancies. There will be a total of 50 posts. The selection will be based on the Online Examination. The Cochin Shipyard Limited Notification is available on the official website also it is available on this page as well. Candidate should have passed the Degree, Diploma with 60% at least marks from any recognized board will be considered for this recruitment. Candidates will have to register themselves on the www.cochinshipyard.com. More details of upcoming vacancies, qualification list, selection list, etc will be uploaded on www.testhill.com. The online portal to apply for the Cochin Shipyard Limited Recruitment have open from 17 April 2019 to 2 May 2019. If you are interested in the same, check all the important dates related to the Cochin Shipyard Limited Recruitment 2019. Candidate should have passed the Degree, Diploma with 60% at least marks2 from any recognized board will be considered for this recruitment.